It has been a loong while since I've posted here, and, boy has a lot happened since I cut off last year. In short, I arrived in London and got straight to school, stayed through the holidays, met lots of great friends, had a raucous New Years, then flew to the US in January for my exchange program in North Carolina. 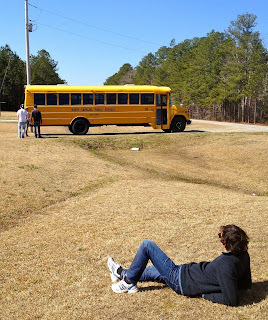 That is where my story picks up, and today's post is about a day trip that I made with some friends to the Outer Banks. North Carolina has on its licence plate "First in Flight," representing the fact that the first airplanes in the world were flown here. And that's where we went on our trip, to Nags Head, on the state's northeastern coast. It was a 4-hour drive, so that meant starting off early! And for us students, early means 9-ish am! And off we were! 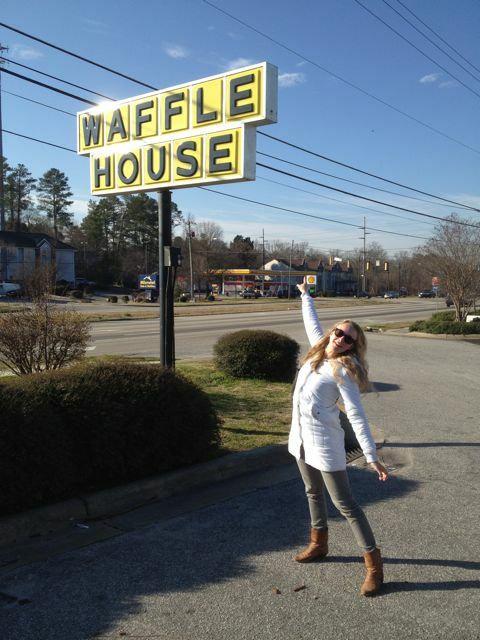 First stop: Waffle House, the ubiquitous chain of diners all around the South. After all, what's a mini-road trip without huge amounts of greasy food?! As we left Raleigh, I introduced my friends to one of the most fun things to do on a road trip: The Chinese Fire Drill. Basically, whenever the car comes to a complete stop, the driver declares "CHINESE FIRE DRILL," and everyone immediately gets out, runs around the car, and returns to a random seat. This means that someone randomly ends up the driver. Thus, we all got turns to drive. For better or worse, we were driving my car, which was a 13-year old Ford Explorer (named Dora) that was often in need of attention. This meant that, after about 3 Chinese fire drills, Dora was gasping for air. 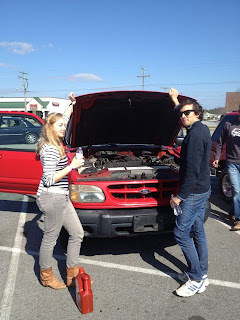 We pulled into a shopping center lot, and luckily there was an Autozone there, which allowed us to buy some oil. It was about time, too, as the car was belching out smoke from underneath. Somehow, I was not worried. Just keeping the car well-oiled was good enough to get us through the day. The day was getting on. And we needed to get on. So we got back on the road. BUT. After 20 minutes or so, I realized that we were on the wrong road! We were driving north instead of west! Apparently the highway switched directions without us noticing. So I re-calculated a route to get us back on track. It led us down some small rural roads, and my foreign friends were complete enamored by a big yellow school bus on the side of the road. So naturally we had to stop and take pictures. It wasn't until the early afternoon (around 1) that we arrived at the Outer Banks. It was mid-February, but the sun was shining and it wasn't as cold as you might think. But after 4 hours on the road, would you have guessed it, we were hungry again! We were recommended to go to the Nags Head Pier and have lunch on the restaurant there, but we checked it out and it was closed. Yep, apparently most stores/restaurants/attractions in town were closed until April. It is a beach town, after all, so it does sort of make sense to close down for the winter. At least we got to enjoy a quick stroll along the beach and the (very chilly) ocean water. Disappointed, but we were not deterred! 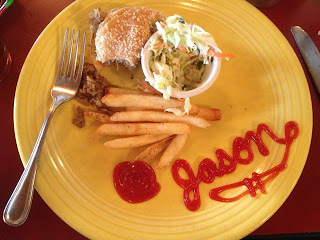 We drove a little bit further north along Virginia Dare and found an all-American restaurant that was open. Time to chow down on some pulled pork washed down with some sweeeeeet tea. Finally, it was time to get some sight seeing under our belt. 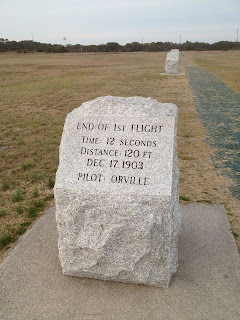 We drove a couple minutes to the Wright Brothers National Memorial, which is a big park preserving the spot where Wilbur and Oroville Wright flew the first airplane! The entry fee was like $4 per person (not per car, unlike other national monuments - how dare they?!). We got in only about half an hour before closing, which meant that we had to rush around a bit. Luckily, the sights weren't that hard to find. 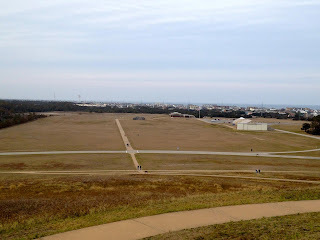 There were two exhibition halls talking about the Wright Brothers' history, etc., and a big hill with a monument on top to the brothers. From that hill you could see across the banks in all directions, pretty amazing! Back down, close to the main visitor center, is a small iron track. 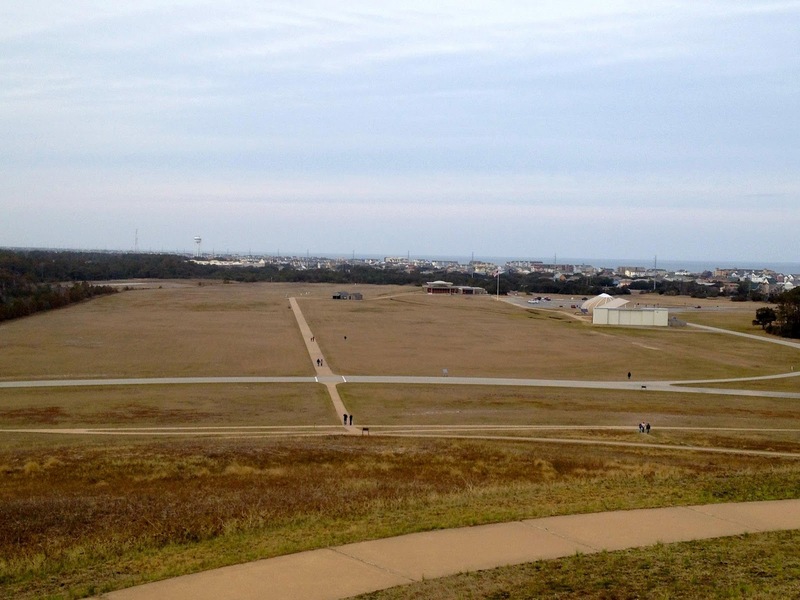 That track is what the Wright borthers used to launch their first airplanes. And there are stones marking the take-off and landing spots and times of each of the 4 first flights. I made sure to run along the track in under 11 seconds, the time of the first flight. Totally doable. The announcement came on that the park was closing and that we had to leave. NOW. So that we did, and as the afternoon was pushing into evening, we pulled into Jockey's Ridge State Park, just down the road. 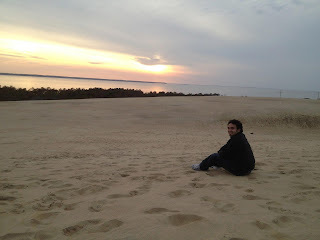 Jockey's Ridge is the largest sand dune in the eastern US, and we climbed atop it to watch the sunset. 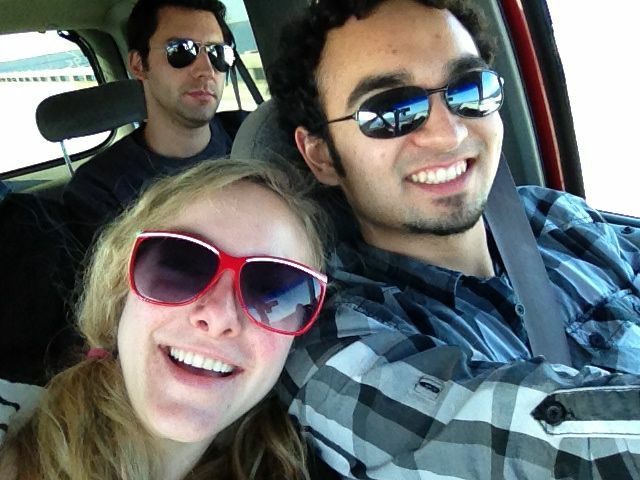 Then, another 4 hours on the road, which was not necessarily as eventful as the drive there, but fun nonetheless. I love road trips. Even if they're only for a day.